Yesterday marked the 25th anniversary of Batman: The Animated Series’ television debut. All sorts of intriguing details have emerged in the wake of the anniversary—but so has some beautiful art, in the form of Kevin Nowlan’s early concept designs for the look of the show. Revealed as part of an extensive Q&A with Nowlan over at 13th Dimension, the early concept work is Nowlan’s small but crucial contribution to the iconic look of the cartoon series. 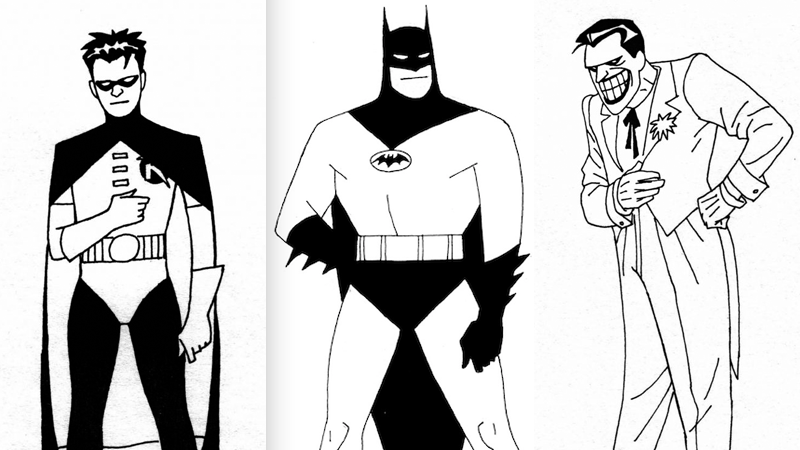 While Bruce Timm, Eric Radomski, and others would go on to define and tweak the art deco noir aesthetic of the show, Timm first turned to Nowlan to nail down the simple, clean style of the show’s character design, eschewing the hyper-detailed and heavily rendered linework that was popular in the comics at the time. Taking inspiration from his own Batman work and even the classic look of the 1966 TV show, Nowlan designed a whole roster of major characters before sending them to Timm for consultation and tweaks that would ultimately form the basis for their designs in the series. Nowlan prioritized creating designs that used as few lines as possible, both to make a simple design to animate as well as to give the series a bold, clean aesthetic. Nowlan’s early Penguin design, and the one eventually used in The Animated Series. While some of Nowlan’s early designs made their way all through the process and onto TV, some did not—like his Penguin, heavily inspired by Burgess Meredith’s version of the character, who would eventually be redesigned to look more like the version seen in the then-recent Tim Burton movies. Head to the link below to see more of Nowlan’s designs, and to read his insight into the early days of an animated legend. It’s well worth checking out.